In our fervent web-browsing, we constantly encounter information that impacts our mindset and defines the way we see ourselves. Unfortunately, much of this self-exploration happens in a different language than the one we were brought up speaking. While it is true that immersing ourselves in other languages and cultural contexts opens up wider horizons for our minds, it is a shame that our recent historical identity remains, for the most part, in the dark. To this day, there is not enough information online that is available in Albanian that enables us to confront our own past. In February 1988, ten years before the Kosovo War started, the Albanian language Rilindja newspaper, the first of its kind to be published in Yugoslavia, initiated a weekly news digest called Rilindja e Javës. It was a thicker publication that went out every Sunday, detailing the often tumultuous events that occurred during the week. 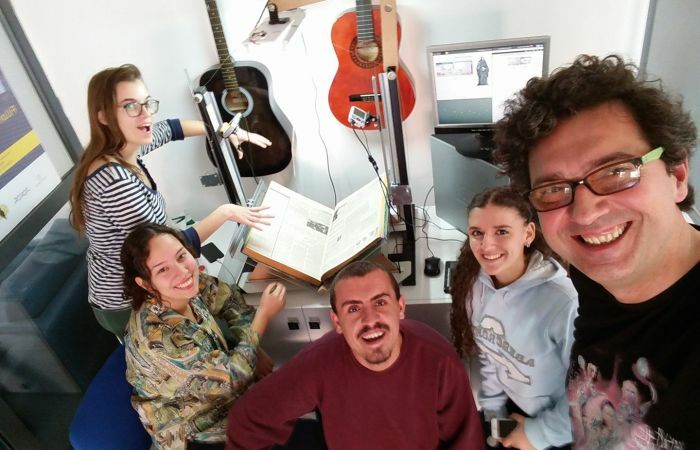 At FLOSSK we were looking for a way to bridge our passion for building DIY Book Scanners with community involvement, and upon encountering Rilindja e Javës, the RI-RILINDJA pilot project was born. We immediately applied for IPKO Foundation sponsorship in order to build a scanner and accommodate volunteers who would become involved in the digitization of the first year of Rilindja e Javës. When building our previous book scanner, we had heavily relied in Do-It-Yourself online design guides, but because Rilindja was published in a large newspaper format, our first challenge in this project was to design and build a scanner which would fit our needs. Once the scanner was complete, we were ready to put out an open call for volunteers. To our pleasant surprise, we received 130 applications in less than 24 hours. Unfortunately, at the time being, we could only accept 15 of them. Over the course of the scanning process, which lasted for two intense weeks, we noticed how our exposure to the content of Rilindja e Javës affected the discussions we were having as a group. Comfortably accommodated in the multimedia room of Hivzi Sulejmani, Prishtina’s public library, we were travelling back in time to an era most of us had only heard about through family anecdotes. We were amazed with how many cinemas there were in Kosovo at the time and with the kind of movies that were shown there. We were baffled with how different the dominating pro-Yugoslav discourse of the time was, compared to how we approach our place in the world today. We were also not-too-surprised to find that a lot of our everyday problems have remained practically the same. To mark the three decades of history that separate us from 1988, as well as one decade of Kosovar independence, together with our media partner Sbunker we will be publishing select articles from the first year of Rilindja e Javës starting from February 2018. Through this partnership, we are hoping to bring more people into the discussion and therefore shine a light on the importance of digitization and collective reflection. Soon after, the complete year of Rilindja e Javës (Feb 1988-Feb 1989) will be available online for browsing. Pull it off without prior experience in a major digitization project. It turns out we were right. The reason we opted for RI-RILINDJA to be a small-scale pilot project was because we were unsure how well we would be able to pt to do that, as we hit quite a few rocks during its execution. For instance, our original idea was to not only scan the content, but also turn all of it into text, which would then be easily searchable. As we were to find out, Optical Character Recognition software and old, large-format newspaper layouts are not the best of friends. At least not yet. Nevertheless, this has not discouraged us. As a matter of fact, it has only inspired us to think about building better solutions in the future. In the meantime, the scanning needs to go on. Our ultimate goal with this project was to begin paving the way for a much needed Kosovar digitization institute. We thought the best way to make that happen was by building a passionate, diverse and decentralized community that will gradually develop and disperse the necessary expertise in order to achieve that goal. Because of RI-RILINDJA, we feel that we are one step closer in that direction. We would like to thank our hardworking volunteers who joined us in this journey and stayed around to help even after the scanning process was over. We hope that through their involvement, this pilot project will only be the beginning of what is to come. We would also like to thank the Hivzi Sylejmani library for providing such a welcoming home to RI-RILINDJA, as well as Sbunker, our media partner, for believing in this project from the get-go. We are forever grateful to IPKO Foundation, without whose support RI-RILINDJA would not have been more than just an enthusiastic idea. Last but not least, we want to thank the people of the Prishtina Hackerspace community who were involved in various stages of the project. We believe in groups of people who pick up pieces and work to bring them into wholesomeness. If you like what we’re doing, don’t hesitate to get in touch with us. We’ll make sure to give you the tools with which you can take this idea forward. If you have a different idea altogether, don’t hesitate to reach out to Ipko Foundation. We have found that they’re always eager to lend their support to dreams that help shape better days for our society. Whether it’s through bringing historical sources to light, or turning our ideas into action, we should constantly be pushing forward by learning from achievements as well as failures. Just don’t hesitate. IPKO Foundation is a local operating foundation in Kosovo. Our goal is to seed and support the development of the next generation of leaders with a digital vision for Kosovo. © 2019 IPKO Foundation. All rights reserved.